Knebworth Park were within sight of an unlikely victory after a determined fightback before two wickets in successive deliveries condemned them to their second defeat in a row at home to Old Albanians. 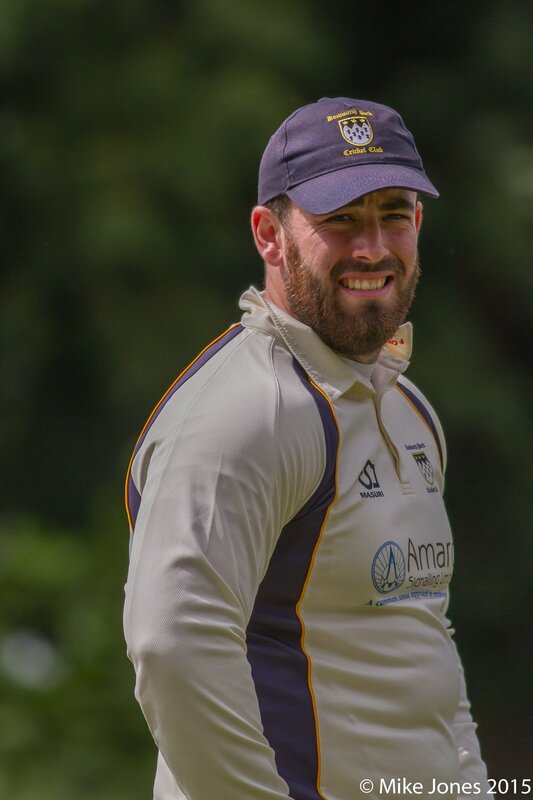 Matt Hutchinson, pictured, standing in as skipper, won the toss and elected to field first and Knebworth were soon under pressure, with the opposition flying to 30 in the first four overs. The Park bowlers then found their lines and with some great fielding and catching had Old Albanian 41-4, Sam McCrow being the pick of the bowlers with 4-25 off his allotted 10 overs. The home side’s middle order pair then put on a 125 partnership with some patient batting and with ten overs to go were looking at a big score. But the Park bowlers finished strongly, with Ali taking 4 for 26 and Gareth Jones 2 for 11 to restrict the opposition to 193. On a flat wicket and short boundary one side, the target of 193 was well within the reach of the Park batters, who also came flying out the blocks reaching 30 in the fourth over. But then the-inform Josh Roseberry was caught down the leg side and that started a steady loss of wickets as the Park team struggled to 81 for 6, with only Adam Sergeant (26) showing resilience. And then with Dave Steadman (24) they began a recovery. At 122 for 8 any thought of winning still seemed distant. But Jones (26) and Jack Orchard (21 not out) suddenly made the impossible look possible. When Jones and Sam McCrow fell in the space of two balls that put an end to the Park team’s hopes and Old Albanian took the 30 points. The bowlers tried the best they could with opener Ollie O’Brien taking 2-81 showing good heart to capture and couple of wickets. Hoddesdon pair Burroughs (95) and Achillia (124) batted superbly but were also aided by some lacklustre fielding as five catches were dropped. Alex Richmond 1-57 was the only bowler to restrict the scoring somewhat as the batsman piled on the runs to reach 363-4 off their 50 overs. The reply started positively with opening pair Rob Morley (21) and skipper Jono Evetts (88) crashing the ball to boundary at a rapid rate. But after Morley ran himself out and only Evetts providing any real resistance to the formidable total the run rate climbed and the Hoddesdon bowlers kept chipping away the wickets. O’Brien (27) and Lewis Hutchinson (27) both batted nicely but the task was just too great and in the end Knebworth were bowled out for 245 just after securing maximum batting bonus points. So, despite the heavy defeat, the Seconds picked up a solid 14 points to help their league campaign. It was a familiar story for the Thirds as another poor performance with the bat ensured their winless run continued against Chipperfield Clarendon to see them drop to second bottom in the table. After electing to bowl, the park opening pair of Ian Woods and Jack Randall began to make early inroads into the Chipperfield lineup with both picking up wickets in the first few overs, the wicket for Woods assisted by an excellent catch from Spencer Bayford. Randall thought he had his second as Park were certain the Chipperfield No.3 had edged to the keeper but the umpire and batsman remained unmoved, a decision that would prove costly as the innings went on. Further wickets did fall though with Woods finishing with figures of 3-21 from his 10 overs as Chipperfield slumped to 58-5. A partnership of 49 for the sixth wicket brought Chipperfield back into the game before the returning Randall finally got his man, dismissing the Chipperfield number 3 for 63 to finish with figures of 3-30 from an excellent 10 overs. The Chipperfield overseas player continued to push the runs up but two wickets for Bayford (2-35) and Kunal Sharma (2-32) brought the innings to a close in the 49th over with the score on 167. Buoyed by their efforts in the field which included two catches for Woods, two for Bayford and three for wicketkeeper Bobbi Orlandi, Park were confident of putting an end to their poor run of form. Unfortunately, the innings never got going with Danny Digweed (29) the only top order batsman to make any kind of score as Park fell to 77-7. A spirited fightback by Randall (11*) and Sharma (24) took the Park to within 50 runs of their target however the damage had already been done earlier in the innings as the final wicket eventually fell in the 42nd over with just 120 runs scored. With a 60-pointer to come against bottom of the table Totteridge next week Park will need to improve dramatically if they are to ensure they do not become embroiled in a relegation battle again. The Fourths won their second successive home match in defeating Harrow Town V by six wickets in as friendly after their original league opponents Baldock III pulled out. Opening bowlers James Roos and Amelia Kemp broke through in the opening two overs before the visitors recovered. Amelia, who finished with 2 for 27, then struck with a second wicket. John Inman and Richard Wheeler then continued the good work with Inman bowling the No 4 bat for 39, and then wickets fell fairly regularly with Inman taking 2 for 15 and Wheeler 3 for 29. A very tidy performance behind the stumps by Izzy Cloke was crowned with a direct hit for a run out and skipper Jonathan Cirkel wrapped up the innings with the final wicket. Knebworth had an early setback when opener Phil Wheeler was run-out backing up at the non-striker’s end when Cirkel hit a shot back at the bowler and it was deflected on to the stump. In the next over, the Park’s innings looked in danger when Simon Roos was bowled. However, Chris Johnson played the anchor role with a determined 19 not out. At the other end, Cirkel was in typically aggressive mood smashing anything pitched up to the boundary before he was bowled off a high full toss for 33. Catherine Cirkel then replaced her father and promptly demonstrated how a high-full toss is meant to be dealt by dispatching three of them to the boundary in a quick-fire innings of 19. James Roos hurried them home to victory with 13 not out.